Focusing on oral language, reading aloud, and language play puts young children on the track to literacy. 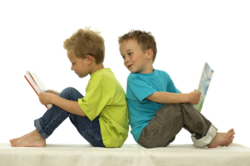 The quality of language development and interaction in the preschool years can, according to Hart & Riley's research (1995), predict reading achievement six years later. The challenges of preschool are growing. To help us meet those challenges, especially in the world of language and literacy learning, we can turn to such trusted voices as Dr. Catherine Snow of Harvard University. She reminds us that the best way to grow language and literacy skills in young children is through "activities that are integrated across different developmental areas." Focusing on the following three essentials, instead of structured sit down lessons, flashcard drills, and worksheets, will keep you (and your children) on the right track. Begin with a foundation of oral language development. Conversations are a powerhouse for learning. Carefully guided, conversations can impact children's vocabulary, help them learn patience and empathy, and progress toward unlocking the alphabetic code. They can expand thinking and knowledge. Conversation stimulates core brain cells, which later become a foundation for the more complex connections needed to read. Carve out time each day for interesting, extended conversations using lots of different (and complex) words. Carefully place objects in centers to spark such discussions. Use talk to help young children explore and understand their world. Encourage the inquisitive. Honor honest questions with a thoughtful, thorough response. Help children tell or retell stories as they view pictures, share something important to them, and answer questions in complete, complex sentences. Partner conversations with read-aloud time. The more naturally you share a story, the more engaged the children will be. Read aloud often to your whole class, but also interact with books in small groups or with individuals. Invite parents in to share their favorites from a list. Preview and pre-read each book carefully. Ask yourself, "What questions might arise in my childrens minds? What might they be interested in learning more about?" Pause from time to time for mini "think-alouds" or mini discussions. Use the magic words "Let's see what happens next" if you find conversation straying too far. Embed phonological awareness in playful, interactive experiences with young children. No structured sit-down lessons. Recent research indicates that as little as 15-20 minutes three times a week is all that's needed to grow phonological awareness. Between conversations, reading aloud, and our next topic (playing with language), you'll have plenty of ways to make that a natural part of each day. To find the proper emphasis, you first need to understand the developmental spectrum of phonological awareness. Visit The University of Northern Iowa for a simple overview. Phonological awareness moves from understanding larger parts of language (sentences, words, syllables) to smaller and smaller portions/sounds within words. Don't rush to the deep end before children grasp the earlier levels. That would be like throwing a child who has never been in the water into the deep end of a pool. When we move to too deep a level without the necessary foundation, children might "parrot" responses you expect because they want to please, but they do not gain understanding that moves them cognitively to the next level. Below are a few ideas for introducing young children to the "pool." If a child has trouble rhyming, step back. He might need to learn to listen. Use familiar environmental sounds. Does a train whistle sound the same as a dog barking? Once children get the idea, they can transfer that abstract thinking to smaller sounds within words (the "-at" in "cat" and "bat"). Be patient. Until now, young children have been thinking about whole words for meaning. If a child has had limited experiences with rich oral language and having stories read to her, she might need more explicit help. Let the child see or feel how your mouth moves when you say a pair of rhyming words. Isolate or over-emphasize the rhyming part, so it's easier for her to hear. Still not getting it? Recommend an evaluation by a specialist. Sometimes, ear infections or frequent allergies can affect auditory abilities. Other times, a child might have a processing problem that, when diagnosed early, can respond well to intervention. Those three big ideas -- oral language development, read-alouds, and play with language -- fit well into the focus in the National Association for the Education of Young Children's and the International Reading Association's joint position statement on reading and writing. Phase one of a child's development (the time between infancy through preschool), is characterized by awareness and exploration. That's why these three essentials are so effective. This approach will keep your classroom from becoming a "pressure cooker" that does more to turn children off to learning than to turn them on to it.